First mindfully prep and measure all the ingredients. Place all the seasonings, except the fresh garlic, in a single little bowl. If you are using dried powdered garlic, that’s fine – just measure the equivalent dose and put it in the seasoning bowl. but if you are using fresh chopped garlic, it will be added later. I do not add salt very often, only when there is a distinct reason to do so. If you are used to it you may find that this needs salt. Set a skillet over medium heat. Add the sweet red pepper and onion strips. Stirring only every now and then so the veggies have plenty of opportunity to connect with the pan which results in some lovely brown bits that add delicious savory qualities. You don’t have to caramelize them now. They will finish caramelizing with the mushrooms. When the onions and peppers are quite soft, add the mushrooms and continue to sauté until the mushrooms are beautifully brown..
Add the chopped garlic and sauté two minutes. Pour in the seasonings and stir for not quite a minute (make sure to take a whiff as the seasonings begin to meld with the veggies – sublime). Finally, add the brown sugar, tomato bits, and tomato paste and stir well. Allow the mixture to simmer a few minutes while you toast a whole wheat bun. When the bun is toasty, your Sloppy Portobello is ready to be assembled. Set out some extra napkins, I mean it when I say these are sloppy! 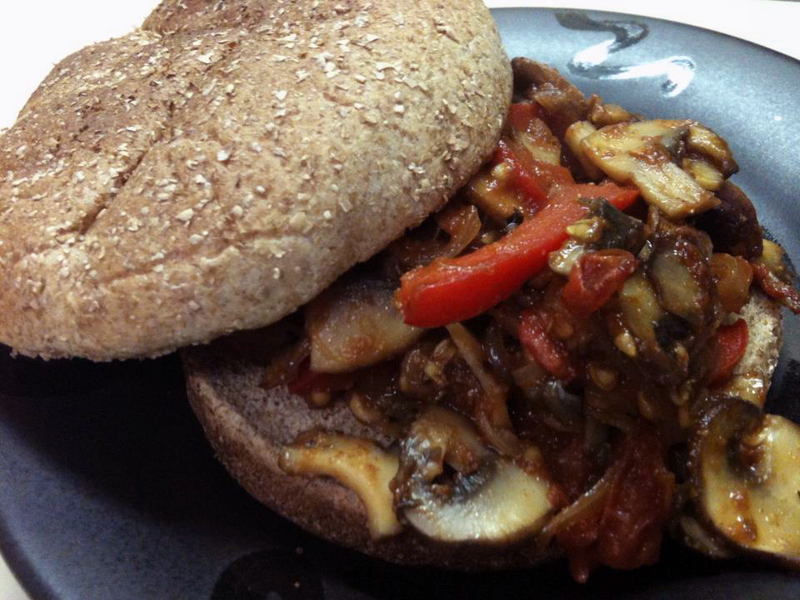 This entry was posted in Main Dish, Mushrooms, Sandwich, Vegetarian and tagged caramelized, portobello, sloppy. Bookmark the permalink.